You already know by now about my undying love for candles. The love affair not only continues into the holiday season; it intensifies. I prefer my scents in the winter to be strong, pronounced, and, especially for Christmas, festive. I scooped up all the candles currently in my apartment that I’ve been burning to make the holidays extra special. 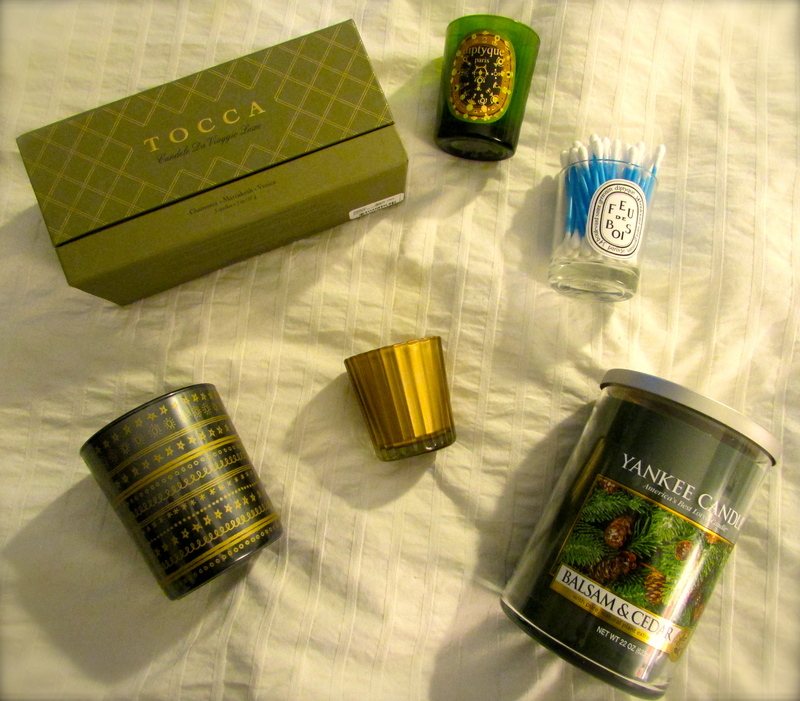 one | this tocca Christmas candle trio is my Christmas gift from Jesse, our roommate. the three candles are chamonix (pine), marrakech (clove and spices), and venice (peach bellini). each one comes in the golden scalloped votive seen in the center of the picture. I haven’t burned these yet as they’re for Christmas, but they’re quite scented unburned, and I can tell that they’ll be great winter scents, especially the pine and Morrocan-inspired ones. the peach bellini I’m thinking will be apropos for New Year’s Eve. two | space.nk is one of my favorite haunts, and I’m a fan of their shimmering spice candle, which literally smells like a kitchen that’s been producing Christmas baked goods all day – cinnamon, orange zest, sugar, etc. it’s not at all cloying – just a heavily spiced potpourri of sorts in candle form. I ordered from the space.nk website and found last year’s version of a black tumbler with gold stars, squiggles, and lines for half of the cost of this year’s version, which has the exact same scent but comes in a lovely striped, red tumbler. three | yankee candle’s balsam & cedar is the next best thing to having a live tree for Christmas. it’s heavy on the cedar and pine, as the name suggests, but it never borders on insect-repellant territory. it makes our whole apartment smell like a pine forest. it’s also a more masculine scent, which James appreciates. four | continuing with the pine is diptyque’s ecorce de pin (pine bark) candle from their holiday collection this year. it comes in this beautiful green glass jar, with an intricate label. it smells of the japanese cypress, which is similar to pine, but I would say it’s sweeter and more mellow. don’t let the small size fool you – a few minutes after I light this baby, the whole room smells of it. I wish it weren’t limited edition, because it would be a great scent all through the winter. five | and lastly, diptyque’s feu de bois. I obviously love it because I have no candle to show you – just an empty jar that I’ve upcycled into a q-tip holder. this candle smells like a burning fire, which is perfect for the cold, dark nights of the season. I don’t have a fireplace but dream of having one someday. until then, this will have to do. it’s smoky and deep and cozy. I was hesitant at first to try it because the scent is intense if you sniff it straight out of the jar – all you really get is the smoke. but once it’s burning, all the other layers come out, and the scent is lovely. James is a massive fan of this one, as am I. it’s definitely my favorite winter scent ever, and is a contender for my favorite diptyque candle in general. yeah, it’s a good one. I can confirm that I love feu de bois, though I wish it had an easier to pronounce name. Is ‘Burning Wood’ or ‘Yule Log’ such a bad name?